My family moved in the spring, and the house we moved into needed a lot of work. It had previously been a rental house, so it wasn’t well cared for, but my husband and I really liked the layout and the “bones” of it. So we decided to go for it! We did some major renovations, including replacing the kitchen, replacing the flooring in the entire house, and painting the entire house. We knew we wanted to replace the carpet. There was carpet in the living room, up the stairs and in all the upstairs rooms. The main floor had some hardwood, but unfortunately it couldn’t be salvaged. Gaps had started to appear and our contractor told us it would likely get worse and we’d need to replace it in a few years. So we decided to take all the flooring out and start fresh, with no carpet to absorb dirt and dust. Of course I really wanted to find something that was environmentally friendly, and toxin free. We looked at hardwood, cork, and cork/hardwood composites but didn’t love anything we saw. Vinyl plank wasn’t an option for us because of the off-gassing concerns. Cork on its own as well as cork/hardwood seemed to have mixed reviews because of the softness of it, making it less durable. Hardwood could be more difficult to maintain and I was uncertain about how well we’d do with it in our dry climate. Then we came across Forbo Marmoleum Click at Carbon Environmental Boutique and fell in love! Forbo Marmoleum Click is a natural product made from renewable resources, including linseed oil, wood flour, and pine rosins. It has anti-static properties to repel dust and dirt, which make it easy to clean. These properties also allow it to contribute to better air quality because it reduces exposure to allergens. Marmoleum Click has the Asthma & Allergy Friendly™ designation. Because it “clicks” together without, there are no chemicals or coatings with fumes and gases. It has a cork backing, which makes it easier on our feet than other hard floors. Because the flooring itself is marmoleum, it’s very durable and easy to clean. We decided to go with White Cliffs to match the paint colour we chose for the walls, and because we wanted to create a light airy feel. 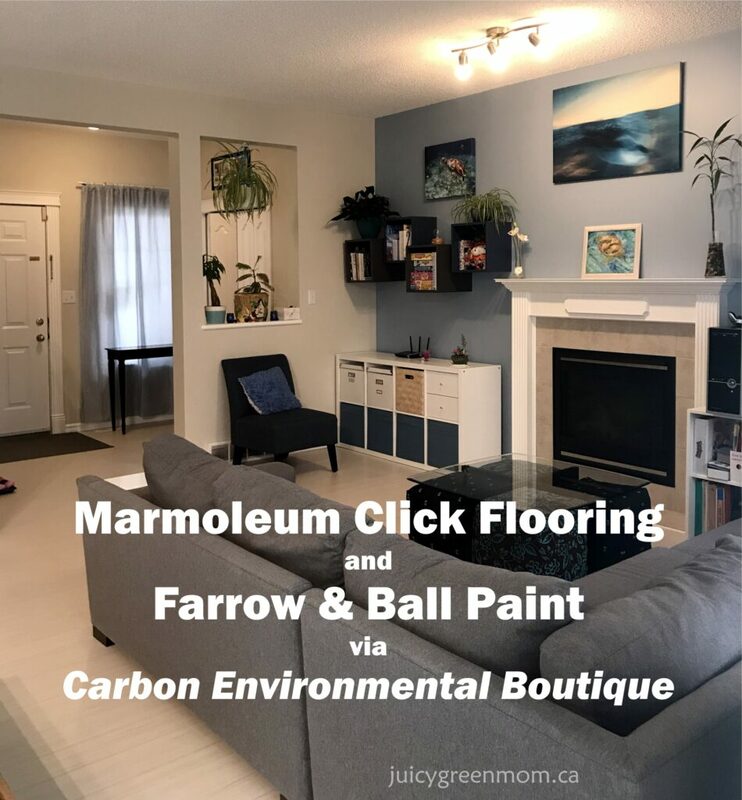 We were already familiar with toxin free Farrow & Ball paint from when we did basement renovations in our previous house, so we knew we would choose it again. Our primary wall colour was Shadow White in the Estate Emulsion finish, with accent walls in Lulworth Blue. 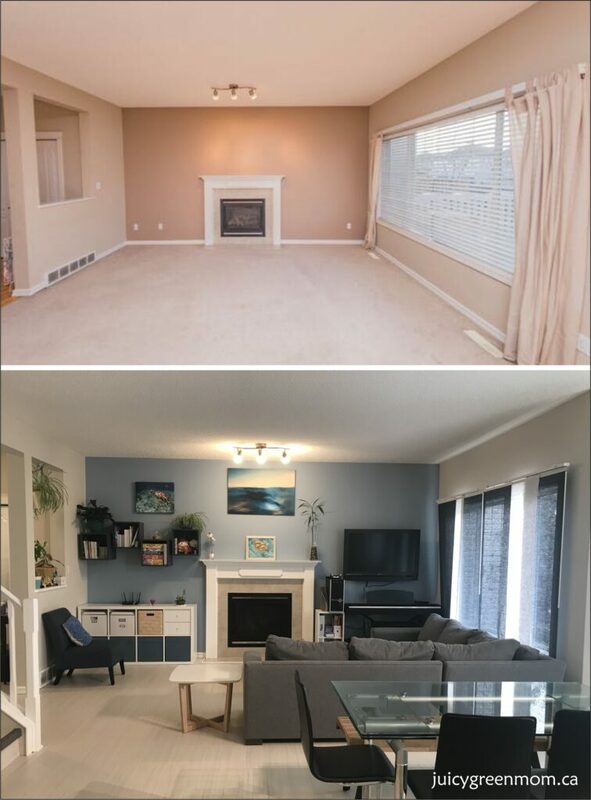 Here are some before and after photos of our main floor! We had the kitchen taken out and we replaced it with an IKEA kitchen. I know some people don’t think IKEA cabinets are the best quality. We are very happy with ours – I like IKEA’s commitment to lower their environmental impact, and being able to customize the cabinets with drawers and interior fittings is awesome. Their appliances are Whirlpool brand, and many of them are EnergyStar rated, which is another positive in my books! 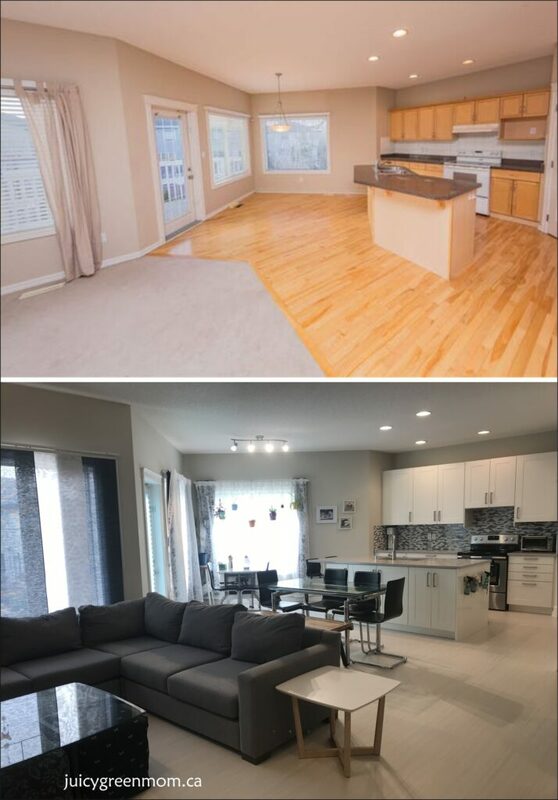 I really like that taking out the carpet and hardwood and replacing it with Marmoleum Click flooring allowed us to rework the space. 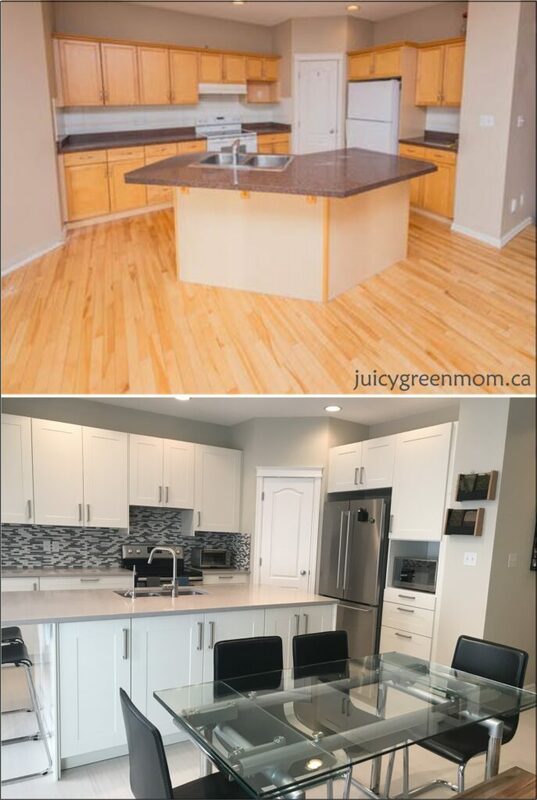 No defined boundaries between living room and kitchen means we can adapt the space to what we need! We are loving the open airy feel of our home, and the new flooring and wall colours really contribute to this. The Marmoleum Click is very easy to clean and so far has been very durable. 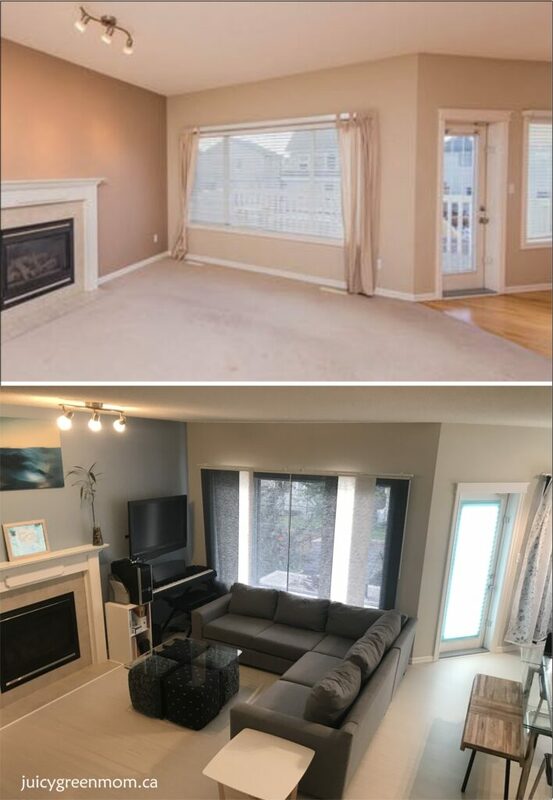 And I LOVE that we don’t have carpet to allow all the dust and dirt to settle in and affect our air quality… We are so happy about the changes! What do you think about Marmoleum Click Flooring and Farrow & Ball Paint? Thanks for this post! At some point we will have to replace our flooring and our carpet, and I was dreading it because of the likely off-gassing from the finish. I’m glad to have some ideas for alternatives. If it’s old flooring and carpet, the good thing is that lots of the off-gassing has probably already occurred. I would recommend doing it at a time of year that you can have windows open to help air things out! Yes for sure! Did you use the marmoleum in your main floor bathroom as well? Bathrooms are not listed among the rooms for suggested use on the product description, so wondering if there is a reason why. Was there any smell associated with the flooring after installation? We did use it in our main floor bathroom that doesn’t have a bathtub (just a half bath). We tried it in my daughter’s bathroom but there was some swelling when we had a toilet leak because it does have a cork backing, so I wouldn’t recommend it for a full bathroom. Zero smell associated with installation – even with opening the boxes, there was no smell at all.